Quick post today. Sorry if you stopped in earlier and got a white screen or other messages. Apparently a plugin update cause the whole site to have a fatal error. Good times! Now to happy things! We have the most wonderful sketch this week at Freshly Made Sketches from the lovely Cécile. I just love the idea of the layered squares! It didn’t take me long to decide on the smallest squares from the Stitched Shapes Thinlits but then what to add? I was looking through my stamp sets and the most counterintuitive set jumped out at me. Mondo Hydrangea by Ellen Hutson! So yes, the mondo flower was not the right fit for the squares but the little blossoms were perfectly sized! I stamped them in Versafine ink onto Fabriano watercolor paper and colored with my Zigs. Simple coloring but oh so pretty! I added on a little sentiment from another Ellen Hutson set called Lovely. Am I allowed to say how happy I am with this card? I was fighting with my mojo a bit this week and having this card come together quickly saved a bit of my sanity. Ok…off to visit the amazing team. Make sure you stop in to let us know what you think of the sketch and I hope you’ll join in with us. I’ll be back at the beginning of next week with the April release week from Newton’s Nook Designs. Until then, I hope you have a great week! See you soon. I’ve just one word: gorgeous! Lovely simplicity! You do such nice work, Jen! Oh my these little blossoms are beautiful! You have a way with simple elegance my friend! Just lovely! So beautiful and so beautifully CAS! This is such a wonderful interpretation of the sketch! 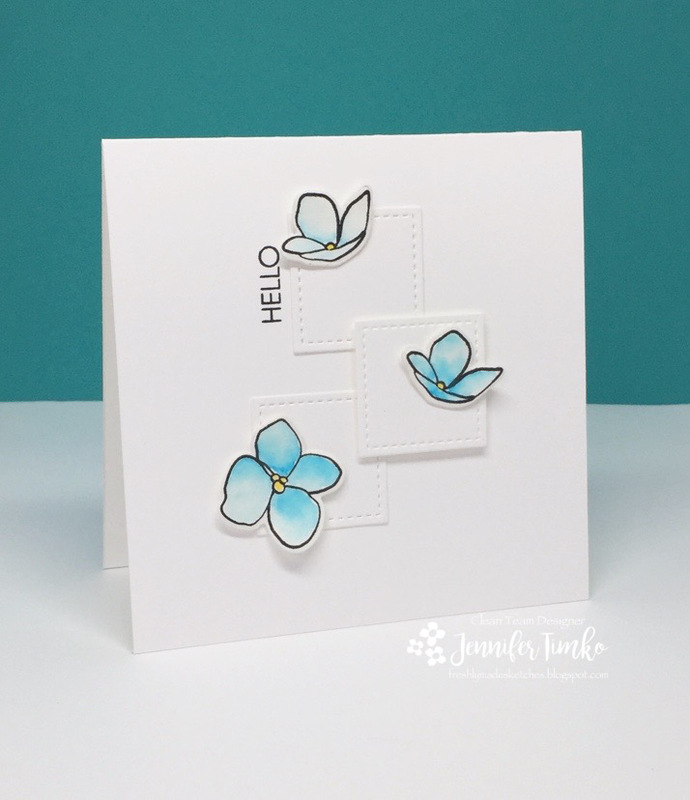 This card is gorgeous Jen! I love all the white!!! Those little flowers are so perfect and the colour is amazing! You are totally allowed to say how happy you are with this card because it is totally awesome! Your design is simply perfection! This is such a fabulous take on the sketch, Jen! So clean, so crisp, so beautiful!